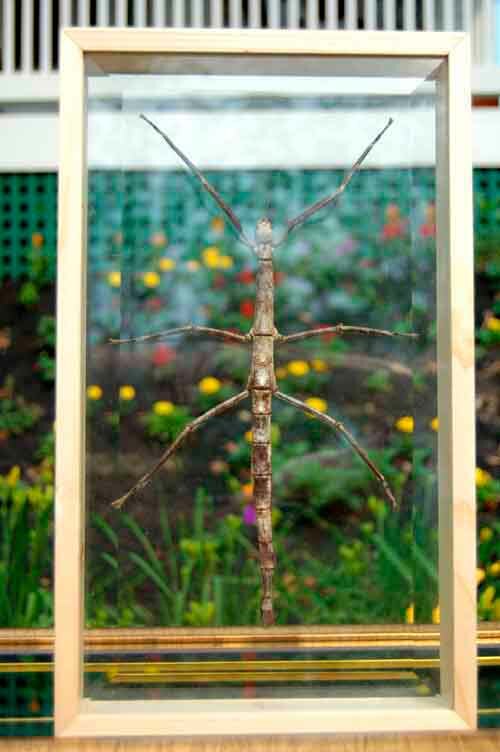 The walking stick is a common but often overlooked insect in the world of entomology because it is not a problem as a pest either to farmers or to ordinary people. These peaceful insects are strictly vegetarians feeding on berry, cherry and a variety of other leaves. There are over 3000 varieties of walking sticks identified world wide! Walking sticks are found primarily in the temperate and tropical regions. These creatures spend their days motionless hanging from leaves and branches waiting until dark to feed. This particular insect gets its name from its appearance, looking much like a twig or in some cases the leaves upon which it feeds. This is a beautiful specimen framed in a finished wood frame with double glass and thick beveled glass on the front. This is a giant bug ! You will be mesmerized by the colorful complexity of this glorious insect. The display is approximately 15" tall x 9" wide and 2" thick. We mount using two pieces of glass because the front is as beautiful as the back. We also use the latest mounting technique that eliminates all smells associated with mothballs. This is important because displays using mothballs inside the frame have a strong odor. The use of beveled glass adds to the beauty of this display. It can sit on a shelf or be hung on the wall. This is a very high quality display. I guarantee this display presentation is twice as attractive as any you have ever seen. Each frame is an individual work of art and can vary slightly. The pictures don't do justice to the beauty of the displays. This is a very beautiful piece and a great accent for any home or office.